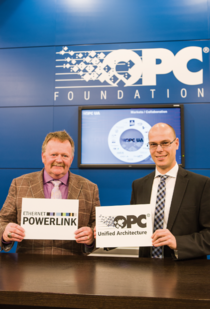 The OPC Foundation and the EPSG are collaborating on interface-free communication within and between production systems. To achieve this, they are collaborating on a companion specification. All the machine data is mapped from the OPC UA server to the machine controller, so it is provided in a standardized way.In the future, it will be possible to fully integrate OPC UA into the POWERLINK protocol. In its asynchronous phase – independently of the real-time data – POWERLINK is able to transmit any Ethernet protocol.As a result, gateways become superfluous. There is no need for an interface between the worlds of POWERLINK and IT. A SCADA system will be able to take advantage of OPC UA to do things like access a sensor, change parameters or retrieve diagnostic information. All OPC UA services will be available without limitations. OPC Unified Architecture (OPC UA) is a manufacturer-independent communication protocol for automation applications in industry. It is based on the client-server principle and allows complete communication, from the ERP system to the individual sensors and actuators. The protocol is flexible, platform-independent and possesses built-in safety mechanisms. OPC UA is therefore regarded as the ideal communication protocol for the implementation of Industry 4.0. The protocol has several integrated safety mechanisms. If need be, user-level security, application-level security and transport-level security can be implemented individually or in combination. With the use of secure X.509 certificates, the OPC UA protocol meets strict IT security standards. The OPC Foundation is an independent committee that specifies and develops the OPC UA standard. The OPC Foundation currently has more than 450 members (as of December 2015), including all of the largest automation manufacturers. What does OPC UA give the user? OPC UA allows the transfer of raw data and preprocessed information from the sensor and field level to the control system and into production planning systems. Interfaces, gateways and the associated loss of information are a thing of the past. OPC UA enables the integration of production data, alarms, events and historical data into an OPC UA server. For example, this allows a temperature measuring device to be portrayed as an object that contains the temperature value, alarm parameters as well as the corresponding alarm limits. This information is available to every OPC UA client. So that data can be used without manufacturer or platform limitations, it is translated by OPC UA into information that contains the required context with which every OPC UA-capable device can interpret and use the data. This process is called data modeling. Generally valid information models are contained in the OPC UA specifications. Based on these models, additional models can be added if need be.